Soup will warms you up in any moment. 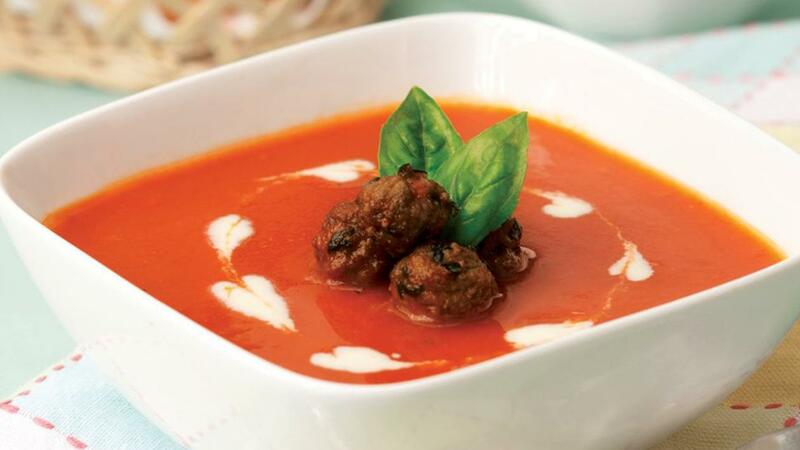 This tomato soup with meatballs will give you creamy taste to indulge every guests. Add 400 g KNORR Tomato Pronto water into a blender and puree. Move the tomato soup into the pot and heat. Add salt, pepper and sugar. After boiling add the remaining 100 g pronto into the soup, set aside. Combine all ingredients, stir to mix. Heat oil, then using a spoon shape mincemeat like little balls, then fried until slightly brown. Put the meat balls omn the center of the bowl and then pour the tomato soup. Put some cream and thin slices of a basil leaf on the top.